That Mr Godwin Nogheghase Obaseki’s government in Edo State would be a colossal success should never have been in doubt. The handwriting had always been on the wall; but those who are wanting when foresight is being deployed could not have perceived it. His background in finance and international business is a pointer to the timeliness of his emergence as governor, especially seeing as Nigeria is going through such a harrowingly inflationary strait in its financial affairs. In times as these, when virtually every state economy in the country seems headed for the rocks, it will require nothing more than a skilled economist and leader at the helms of affairs, and compliantly adjuvant people to sail against the tide and pull through. Barring an insignificant number of unhappy partisans, there is already enough belief in Governor Obaseki’s capability to move Edo to the next level. The Oba of Benin, Omo N’Oba N’Edo Uku’ Akpolokpolo Ewuare II paid him a visit and said he would support his administration. In addition, religious leaders in the state have also promised to work with him to address and rectify the issue of children roaming about the street and engaging in unprofitable ventures. By so doing, the aim is to create an enabling environment for children to make something of themselves in Edo State. The major stakeholders in the state, the judiciary and legislature, have also shown support. The diligence and zeal with which the legislature worked on and passed the 2017 appropriation bill, also known as the budget of consolidation and prosperity is testament to their support. Both the outgoing and newly appointed Chief Justice of Edo State also expressed support for Governor Godwin Obaseki, with the governor also realising the need to renovate and refurbish the premises of the Edo State High Court in Benin City as well as to create incentives that can attract more judges to Edo State. However, Governor Obaseki is no neophyte to economic administration. He was Chairman of Edo State Government’s Economic and Strategy Team from March 17, 2009 under Governor Adams Oshiomole, a position he held pro bono. He accomplished a great deal while he held that office, and has drafted a template to adopt that economic profile and constitute a government of continuity. This continuity is not, as many overfretting critics opine, a replication of the Oshiomhole-led administration. Ab initio, it may have been permissible to think such would be the case seeing as not many critics have the forbearance to accord leaders the benefit of doubt. However, after 100 days, surely it is clear to every critic that while Obaseki respects former Governor Adams Oshiomole, he is not going to replicate his administration. Broadly speaking, he has realised the need to adopt the same progressive mentality. He has also keyed into specific philosophies like the need to export products and not people as a state, the need to look to agriculture as an alternative source of income, the need to overhaul and electrify the educational system so that young ones don’t go to school amiss, and so on. One only needs to listen to the governor speak or read his budget and new year speeches to have a good grasp of what continuity he is really aiming to pursue. To facilitate an increase in export and to generate extra revenue from it, then the state needs to be producing more than it can consume. The thrust of Obaseki’s economic policies has considered this factor and is setting about developing talents within the state. First, upon realising that the youths that could have been deployed to drive production, are feeling more at home at thuggish endeavours. Prior to his stance on manual collection of tax, many youths in Edo State were involved in partisan thuggery and collection of revenue. The governor, in less than 100 days has indicated a firm interest in putting a stop to that. He ordered a cessation on manual collection of taxes and he even introduced a waiver system of up to 50 percent for defaulting taxpayers. He then commissioned a committee to look into electronic means as an alternative to the manual system of collecting tax. This new electronic method, when adopted, will provide employment for up to 10,000 youths. Subsequently, he organised an agribusiness conference in which stakeholders in the agricultural sector were invited in order to strategize how to rejig and revivify the agricultural sector. This is of course even as he had earlier set up an agricultural committee with a target to create about 80,000 jobs. Then the big one; the Gelegele Seaport. According to the governor, “The importance of developing the Gelegele sea port cannot be overemphasized. Apart from the historical importance, Gelegele seaport still has a significant role to play in the future of the economic development of Edo. It will lead to promotion of trade and commerce and employment, lead to significant infrastructure development within the host community and its environs”. The wealth that can be generated from the Gelegele Seaport when it is operational is immense. Every student of history knows that trade plays a great part in the formation of many of the greatest kingdoms and empires in history. In just hundred days, Governor Obaseki has gone to inspect the seaport even as it now lies defunct and temporarily barren. He has also constituted a committee to supervise the development of the seaport while he himself has already gone on a trip to China to meet with investors and woo them to set up in Benin. That this musing is even possible is a reflection of the transparency of the Obaseki-led administration. He has recognised the importance of the people in a democratic government and has accordingly opted to carry them along. Indeed, Governor Obaseki not satisfied with his government’s transparency, revealed plans to improve his government’s communication structure. The governor has accomplished so much in so little time and this is a commendable thing. It will not be out of place to rub the palms together gleefully and lick the lips in anticipation of what the governor can possibly achieve at the end of four years. For now though, the trajectory of his administration reveals that it is considerably dependent on the people. He has adopted what may be described as a transactional style of leadership and so the people of Edo State have a key role to play in its success. 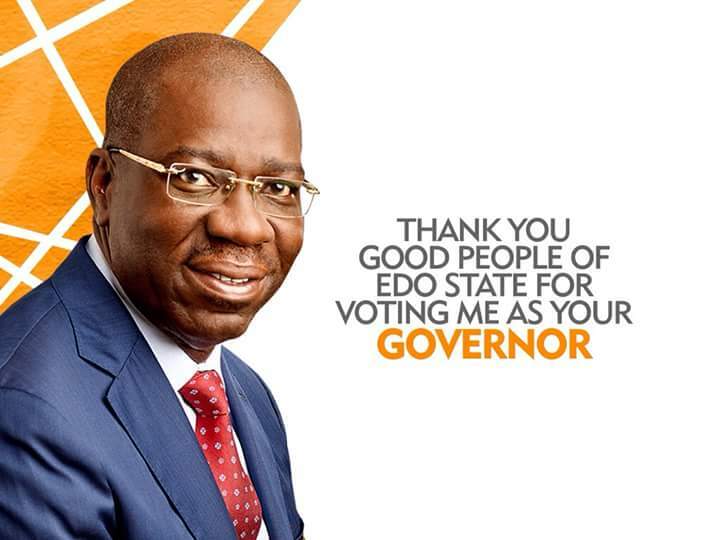 For those who wish the state well, let them put aside their differences, muse on his achievements in 100 days, and work together to make Edo great again.